The Earth can be considered to be a ball of rock. Rocks are formed on and beneath the Earth’s surface by certain geological processes both physical and chemical. The Earth is continually changing and so are the rocks it contains. The rocks are continuously redistributed and recycled. The set of processes by which new rocks are formed from old rock material is called the rock cycle. This has been occurring continuously throughout the history of the Earth. 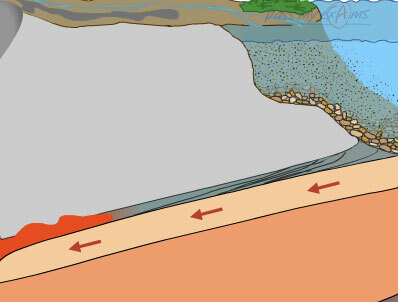 Magma deep below the Earth's crust travels towards the surface via an erupting volcano in the form of lava. The lava rapidly cools on exposure at the Earth's surface forming extrusive igneous rock. 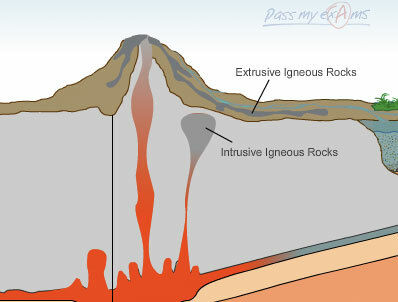 Sometimes the magma cools and crystallises below the Earth's crust to form intrusive igneous rock. The solidified lava on the Earth's surface along with other rocks exposed due to uplift are acted upon by the destructive power of weathering and broken down. Erosion carries this material via various transporting agents. 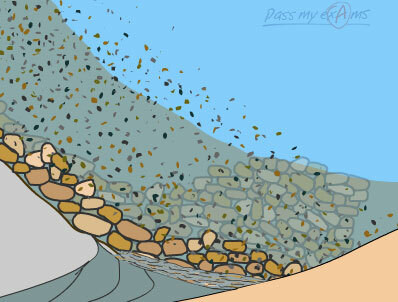 This process removes old rock and exposes new rock from within the Earth's crust. The transported rock fragments or sediments are laid down or deposited in a process called deposition. 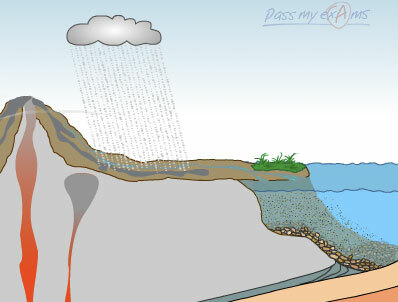 Most of the sediments eventually end up being deposited in the seas and oceans via rivers. Overtime sediments accumulate at the bottom of the seas and oceans. As the layers of sediment build up the rock fragments at the bottom are compacted by the weight of the overlying layers. 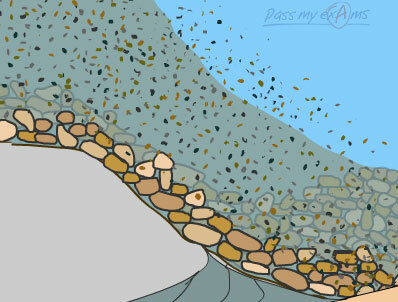 The particles are then cemented together to form a solid rock called sedimentary rock. 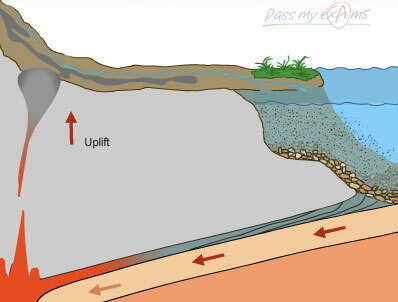 Sedimentary rock is forced underground by movement of the tectonic plates. The rocks are exposed to heat and immense pressure which causes them to change chemically and for metamorphic rocks. Uplift of the Earth's crust via Earthquakes exposes rocks to the Earth's surface. As the rocks get pushed further underground they are exposed to such immense heat that they melt to form magma and so they begin their journey through the rock cycle again.